For years there has been debate on live versus artificial foliage trees, and now that we are all endeavouring to lessen our carbon footprints the arguments have become quite heated. When we buy our trees we choose them for their form, shape and freshness, checking that there are no dry needles or brittle branches. Once they are back here at our nursery we immediately saw approximately 5cm off the base of the trunk and stand them in a bucket of water! Did you know that a live cut tree will drink approximately 3 - 4 pints of water in a day, depending on the temperature of your room? Treat your Christmas tree like a giant cut flower, give it plenty of fresh water. We always use tree stands that include reservoirs so that watering is relatively easy for our clients to do on a daily basis. For the best results your Christmas tree should be kept in the coolest part of the room, well away from heaters, hot air blowers and other sources of direct heat. 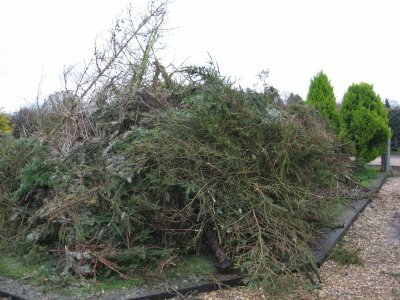 Trees and Christmas decorations are traditionally taken down on 12th Night - 6th January, but many are cleared away just after the New Year as can be seen from the poor desiccated trees left out for the dustmen. 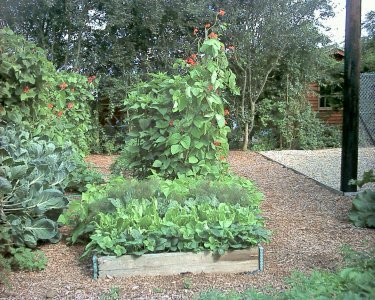 Most local authorities now offer a collection service where the trees are shredded and mixed with other green waste to produce bags of eco-growing medium, however we prefer to utilise this rich source of plant material on our own nursery site. 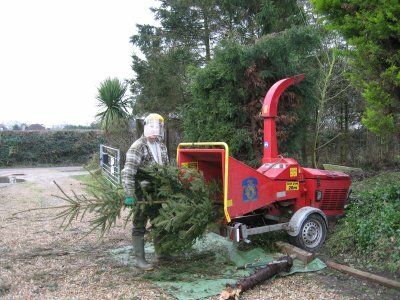 Once the trees have all been brought back here we shred them into a lovely smelling mound of pine chippings which we then spread onto the paths between our raised vegetable beds. After about a year or so they rot down and need topping up with the next year's trees, the perfect cycle. Pile of trees ready for grinding.